The blue ocean, the curves of the infinity pool, and the contrasting green cacti all make this photo interesting but what I love most about it is the happiness of the bride's laugh and the groom's smile! This wedding photo was taken just after the couple changed out of traditional Indian wedding outfits and into their western gown and tuxedo. It was the first time they saw each other in their new wedding outfits and they were so excited! To be officially married, and to be heading to the reception in the palm groves of Casa Teitiare and Casa Ninamu to celebrate with their friends and family. 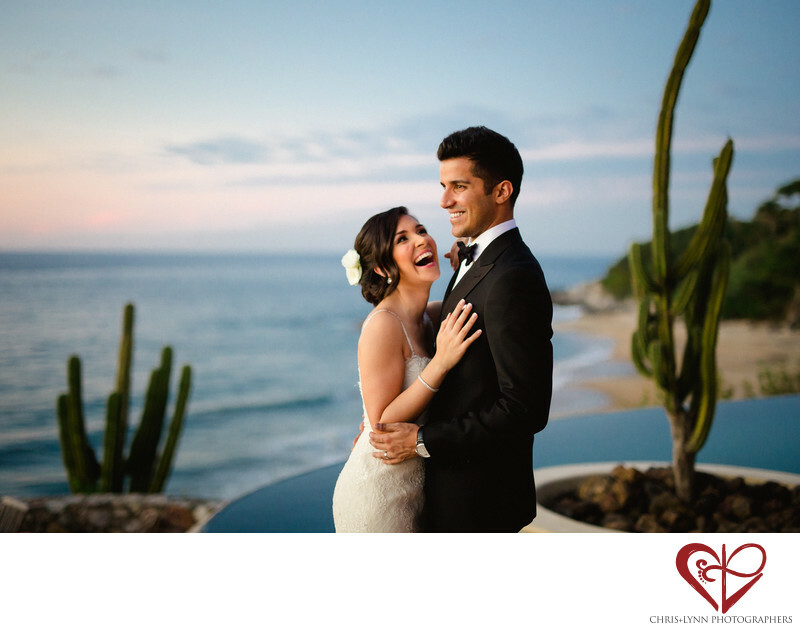 Shooting this destination wedding was a treat for us because we’ve known the groom for several years through the weddings we have shot of his friends in Vancouver, Los Cabos, and Italy! Last year we were honored to photograph his sister’s fabulous 3-day Vancouver Indian wedding alongside Desy & his cinematography team at RF Productions, so seeing everyone all together again at this Sayulita private villa wedding felt like a Vancouver family reunion! Location: Calle Norte 200, Camino a La Playa Escondida, 63732 Sayulita, Nay., Mexico Teitiare. 1/250; f/1.4; ISO 1600; 50.0 mm.